In the last 24 hours, South Korean focused Peninsula Mines (ASX: PSM) has announced some promising early stage exploration results from its gold and zinc operations in South Korea. This double dose of good news has resulted in the company’s shares increasing more than 6% on Tuesday morning with potential for more upside as the results are disseminated. However, PSM is an early stage company and historical trading activity is not indicative of future share price performances. Investors considering PSM should not base investment decisions on this data alone. It should also be borne in mind that the company is an early stage exploration group with no immediate production profile. 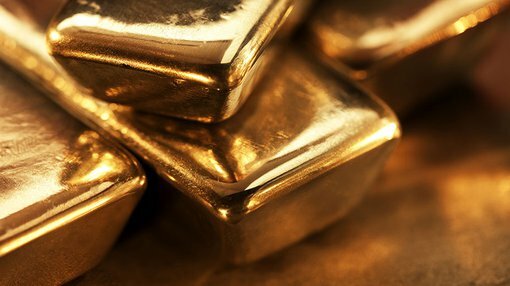 Management reported high grade gold intersections from new channel sampling results within the 30 metre wide veined zone at the Osu gold project. These included 5.7 metres grading 3.1 grams per tonne gold including 1.25 metres at 7.73 grams per tonne. While there were other double-digit grades at much narrower widths as outlined below, the new information will assist the group in establishing drilling targets, particularly in relation to down plunge extensions of the high grade zones intersected. Management highlighted that approval from the Forestry Department would be required to progress to this stage. 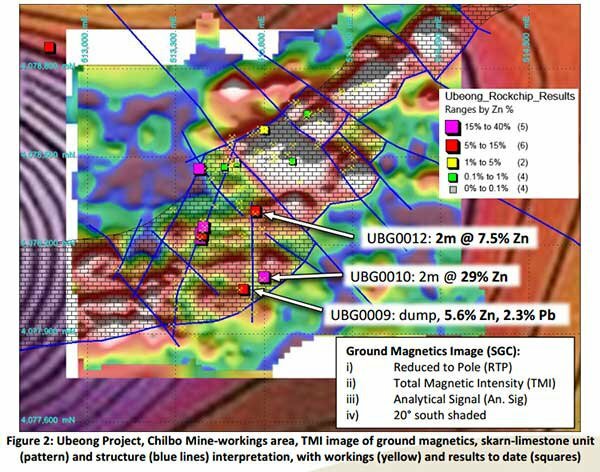 In summing up this latest development, PSM’s CEO John Dugdale said, “The results from channel sampling recently undertaken at Osu have demonstrated there are multiple high grade vein zones that we can now test with drilling to target potential high-grade shoots of gold-silver mineralisation”. PSM has been rewarded for accelerating its exploration activities at the Ubeong zinc-silver project as channel sampling results have yielded further high grade zinc-silver returns. These included 2 metres grading 29% zinc from outcropping massive sulphide lodes associated with workings now located over a two square kilometre area. Management is particularly encouraged by the identification of a major mineralised zinc skarn district associated with the historical Chilbo mine workings. The newly sampled workings are located to the south of previously identified mineralisation which included zinc grades of up to 39.7%. A selection of channel sampling results are listed below. Detailed mapping of the broader area is currently in progress which has resulted in the identification of numerous additional workings, many of which have yet to be sampled. 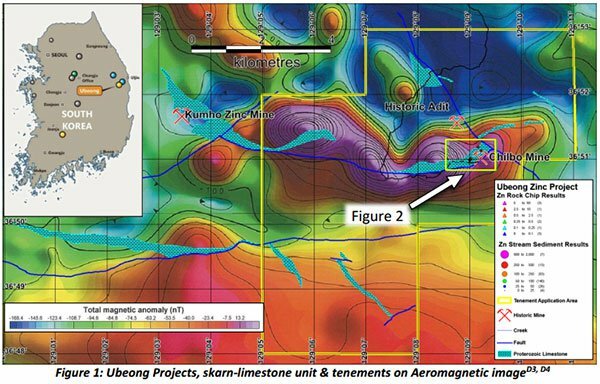 It is this data combined with exploration results to date that has provided management with confidence that PSM has identified a major zinc skarn district, with the Chilbo historical mine on the eastern side of the system, whilst 10 kilometres to the west is the operating Kumho Zinc Mine, just outside the company’s tenement applications. Relevant data is highlighted in the following surveys. In order to define the extent of mineralisation, a soil sampling program will be conducted along the 100 metres based magnetics lines with the objective of defining anomalies associated with the mineralised trends. Once mapping and soil sampling has been completed PSM will be in a position to identify designated drilling targets which will be tested in early 2017 subject to the grant of key tenements targeted and access permission to the relevant drill sites from the Korean Forestry Service.